Intel graphic (very small graphics memory). Now i am having a good laptop with NADIA Breath Taking Graphics. But i still remember my past days those days i was using a software to play many high graphics card games. i have almost played 1000s of games on my laptop.So on those days i was using a software knows as 3D Analyzer.One of the best Graphics Emulator. 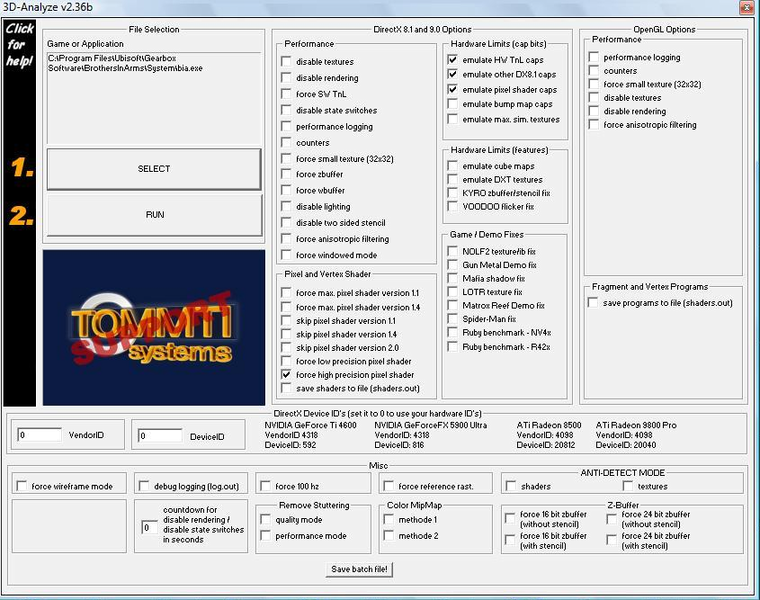 Actually 3d Analyze is a Graphics Card Emulator that can emulate all the features of a 3d graphics card like pixel shader 1.1, 1.4, 2.0, bump maps and lots stuff. If a game stops running on your system just because u don't have a graphics card, don't worry! 3d analyze will do it for you. Run 3danalyze, Select the game exe, Select a few options you want to emulate and there u go the game runs perfectly now. Click Select. A window will open, Navigate to the .exe of the game you want to play. Now put a tick in the boxes, Emulate HW TnL Caps, Emulate other dc8.1 caps, Emulate pixel shader caps, and Force high precision pixels.